Prior to the release of Sonic Mania in 2017, a number of indie titles including Freedom Planet filled the void. Originally released in 2014 on the Wii U eShop and multiple other platforms, XSEED Games and Marvelous are finally bringing GalaxyTrail’s smash hit to the Switch eShop on 30th August. US fans can pre-purchase the game right now for $14.99, and in Europe, the game will be ready for pre-purchase soon for €14.99 / £12.99. 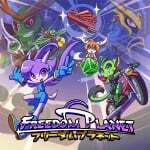 Freedom Planet is a fast-paced combat-driven platform adventure that pits a spunky dragon girl and her friends against hostile foreign powers and alien attack forces. There's trouble around every turn, from insects to giant robots to sheer explosive destruction, but players will have a variety of special fighting abilities at their disposal to blast through more than a dozen massive, nonlinear stages. The campaign may be played through as Lilac, Carol, or the unlockable Milla, each of whom has completely unique gameplay mechanics, an altered story mode in which the selected character takes the lead, and even a few of her own unique stages. The Sonic inspired release includes an adventure mode, with over an hour’s worth of fully voiced cutscenes to flesh out a “dramatic” storyline, and there’s a classic mode, too. This throws players straight into the action, allowing Switch owners to enjoy the game at home or on the go. Take a look at the game’s character trailer above and tell us in the comments if you’ve played Freedom Planet in the past, and if you would be interested in trying it out on the Switch. The last of the indie games I have on Wii U but not on Switch. Yep, the Switch’s gimmick certainly is convenience. Hopefully getting all of these indies on Switch in its first years will lead to a greater ratio of NEW games in the time to come. I didn’t care for this one. I got it free on Wii u from the humble bundle thing a few years ago. Bout time. I won't be double dipping, but I'm glad it'll be available to the Switch audience. Looking forward to part 2 if it hopefully comes to Switch. Excellent game, practically given away on Wii U though. The price isn’t bad... maybe if they make a physical release, bundling it with Freedom Planet 2... that would be really cool! Definitely going to get this again even though I already got it on Wii U. It's the game that Sonic 4 should had been pre-Sonic Mania. Defo triple dipping, one of my top games of 2015 (when I first played on PC). Hope a physical version eventually comes from one of the limited game groups. This should of been a physical. I played it years ago on the wiiu and have no reason to get this. If you haven't played it though you absolutely should. The game’s gone missing on the Wii U European eShop? With the success of Sonic Mania, I wouldn't expect anything less for the developer to get it to the Switch ASAP. So glad I waited from getting it on the Wii U! But...I want a physical version! I think I'm going to skip the pre-order discount and roll the dice to see if one of the collectible companies releases one. This game has always looked great! I'll be buying it again. I don't understand this pre-purchase thing however. Why this as opposed to simply buying it at a later date? @Pazuzu666 the only reason I pre-order are for either pre-order bonuses, if they’re any good mind you and sometimes they have pre order discounts, which again have to be enticing with more than a 10% discount in order for me to jump on it. One of the only indie games I'm tempted to double dip for. It's a fun and unique game. Great game, I just wish they'd have made that sequel. I think there was sort of a tech demo online, but I don't think it has ever become a full game. Definitely purchase for my Switch and hoping we get a sequel as well. Highly recommended this game if you haven't played it yet. The levels and music are pretty cool.